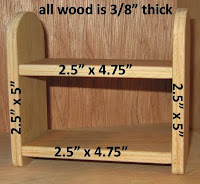 Making your own wooden doll house bunk bed takes a minimum of 4 pieces of wood, but you can also add two dowels to the top bunk to give it rails. I chose to use a nail gun to assemble the bed, but you can also use glue. Follow instructions from the earlier dollhouse bed post on how to wrap the "mattresses". Here is a picture that is better than any explanation! i love how this is not alot of money!